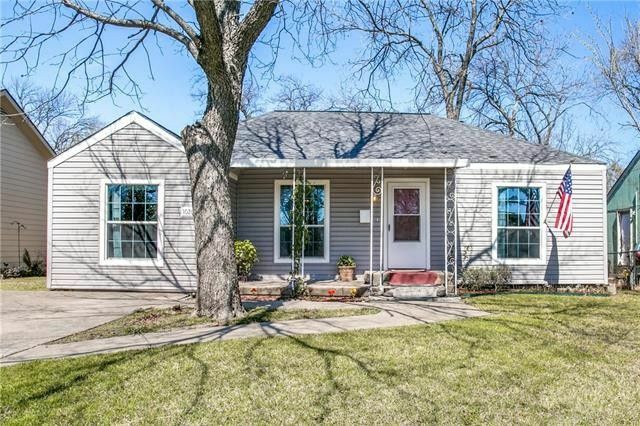 Charming 1940's Home ready for new owners. Classic style home with lots of windows & natural light plus large covered patios in front & back, three bedrooms, large living area & huge backyard. House features split bedroom arrangement, “Wood look” laminate floors in living areas & 1 bedroom. New carpet in other two bedrooms. All bedrooms have ceiling fans. Don't miss full sized utility space in 2nd bedroom closet! Vinyl siding has a lifetime warranty, Kitchen has stainless steel sink, new dishwasher & gas range. Oversized 20' x 12' back covered patio leads to huge yard with storage shed & playhouse in the backyard that stay with the property. New homeowners also get a bonus–Seller to leave Kitchen Refrigerator. Directions: From 30, Exit Beltline, go South on Beltline to Oak Street, turn Left (East) onto Oak. House will be on left (north side of the street). Sign in yard.